The Detroit Tigers’ Comerica Park. Photo by Steve Neavling. 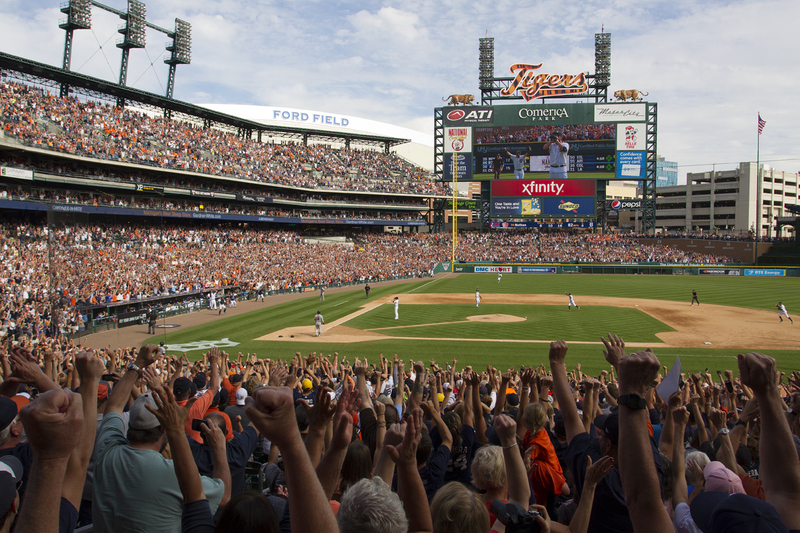 Is Dan Gilbert planning to buy the Detroit Tigers? Speculation has mounted that billionaire Dan Gilbert is planning to buy the Detroit Tigers since he recently began selling his interests in several casinos he owns. Major League Baseball prohibits team owners from owning casinos, and Gilbert is a longtime baseball fan who tried to buy the Milwaukee Brewers in 2004. The Free Press reports that some community leaders have said Gilbert, who owns the NBA’s Cleveland Cavaliers, is negotiating with the Ilitch family to buy the team. Gilbert didn’t deny the reports, but the Ilitch family did. A Detroit charter school closed less than a month into the school year, leaving nearly 200 students in limbo and in danger of not graduating. With no prior notice, the Detroit Delta Prepatory Academy for Social Justice is closing Friday over the protests of parents and students, many of whom have no idea what they’re going to do, the Free Press reports. It’s not the first time a charter school abruptly closed in Detroit, forcing students and parents to quickly look for a new school. Just two weeks before the first day of class in 2o16, University Academy closed on Detroit’s west side. Sudden closures have become a problem since the proliferation of charter schools in Detroit, where inadequate funding for public education has deprived tens of thousands of students of a decent education. Detroit City Council members admonished the police department’s move to get into the towing business, saying it was done quietly to thwart public debate. The criticism earlier this week came after the Detroit Board of Police Commissioners voted 7-2 in favor of allowing the department to provide towing services because of various complaints about predatory towing. The department bought six tow trucks and are using four city-owned lots to impound cars. Some members of the council’s Public Health and Safety Committee accused the police department of quietly plotting to get into the towing business, a move that private tow companies said puts in danger of closing out, the Detroit News reports. “When we sat here and DPD did your complete and total presentation of your budget, not one time was it mentioned about DPD doing towing, switching into towing, looking at a tow trucks … none of that was mentioned, ever,” Councilwoman Janeé Ayers told top brass in the police department.